The first commercially successful table hockey game had its roots in the depths of the Great Depression of the 1930's. Short of cash for Christmas presents, Donald Munro cobbled together a mechanical hockey game for his children from materials found in his Toronto home: clothes pins, coat hanger wire, clock springs and lumber from their coal bin. His family enjoyed the game so much that Mr. Munro decided to make more to sell. He took a prototype to the main Eaton's department store in downtown Toronto where they agreed to take it on consignment. In the time it took him to ride the streetcar home Eaton's had sold it and called up with orders for more. Within a few years his business outgrew his home and he opened a factory from which he began shipping to stores across Canada. Most of his production was marketed through Eaton's and Simpson's mail-order catalogues. Their Christmas catalogs featured Munro hockey games for two decades. 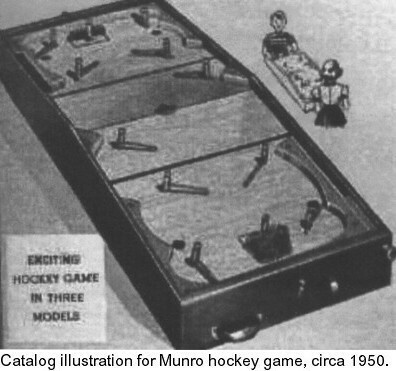 The Munro game is featured in the Hockey Hall of Fame Collectors' Corner" exhibit. Munro obtained a U.S. Patent in 1936. His original model was similar to early pin-ball games with one important difference: it was a two-player game. It had a playing surface which sloped downward toward each end, with a maze of pins on either side of the crown, through which a steel ball bearing had to negotiate to reach the goal. Players at opposite ends of the board used levers to work the goaltenders and the flippers which could propel the rolling ball back toward the opponent's net. Diagram from his first patent (see left margin) shows the game layout with pin-ball mazes. This version underwent major changes before it became the game which popularized table hockey and which morphed into the forms of the game familiar to North Americans today. Removing the pins sped up play considerably. The number of flippers was increased to five aside to make up two full teams. The familiar red and green team colors were adopted and bluelines and face-off circles were added to give it a more authentic look; however, the crowned playing surface was retained to allow the ball-bearing 'puck' to roll freely and ensure play would go on without stoppages. The Munro hockey game thrived and spread throughout the country over the next decades. During World War II, Canadian troops took it with them to England where they prepared for the invasion of Europe. Every Canadian Forces mess hall had a Munro hockey game for R&R and Donald Munro Jr., who served as radar technician during the Battle of Britain, was often called away to make repairs to hockey games throughout the U.K. in order to maintain the morale of the troops. As Munro Games Co. grew it expanded its production line to include other games, such as crokinole. During the 1940's they devised a mechanical baseball game built on the same platform as their hockey game and secured an endorsement from Babe Ruth. Production of the original wooden games ended in 1955, after which the company switched to the new rod-and-slot games with more realistically painted sheet-metal players and plastic parts. Irwin Toy bought out Munro Games in the 1960's. Though Munro games disappeared from the marketplace more than half a century ago, you can build your own working replica of their wooden table hockey game with plans from Vintage Games Co. Visit our catalog to view this project and other wooden games that you can build with our plans.